Maybe it’s being from the Midwest. Lan Samantha Chang had a piece in the Sunday NY Times about living in Iowa, and how the recession hasn’t hit Iowa as hard as it’s hit other states because in the Midwest, there’s “an unspoken belief that one shouldn’t pay an unreasonable sum of money for anything that could conceivably be made, grown or fixed at home.” Although I grew up in a very wealthy suburb, we never had much money. Luckily, at least on my mom’s side of the family, I come from a long line of people who like to make things. My aunt has built houses, my grandmother didn’t like doing the laundry when my mom and her siblings were young so she’d sit down of an evening and whip up three new dresses instead, and my mother is an artist. Our default attitude was that if you can’t afford it, or can’t find one the way you want it, take a crack at making it. So the other day, I ran out of tortillas and I was googling around looking for tortilla recipes when I found this interesting piece over at Culinate by Sara Gilbert about how learning to make tortillas gave her just that much more confidence that she could make things. What I found so fascinating was her very articulate dissection of the negative voice in your head that tells you you can’t, or it won’t be right, or you’ll look ridiculous, or what’s the point in trying. I know that voice all too well from writing fiction, but it really had never occurred to me that maybe that’s one reason people don’t cook. Because they’ve been convinced they can’t make it as well as something from the store. Or that it’s a waste of time to try a recipe that doesn’t work out. I’ve always liked playing around in the kitchen, and since you learn something from even the disasters, I thought her honesty about being afraid to try things was very touching. So, Saturday morning, I decided to take a crack at flour tortillas. I spent a lot of time last summer fooling around with yeast-based flatbreads, and since my love of my Griswold cast iron skillet knows no bounds, well, it seemed like it would be interesting. The dough was easy — 3 cups flour, 4-5 tablespoons lard (I made some last fall when I bought the pig), some salt, enough warm water to make an elastic but not stickly dough. 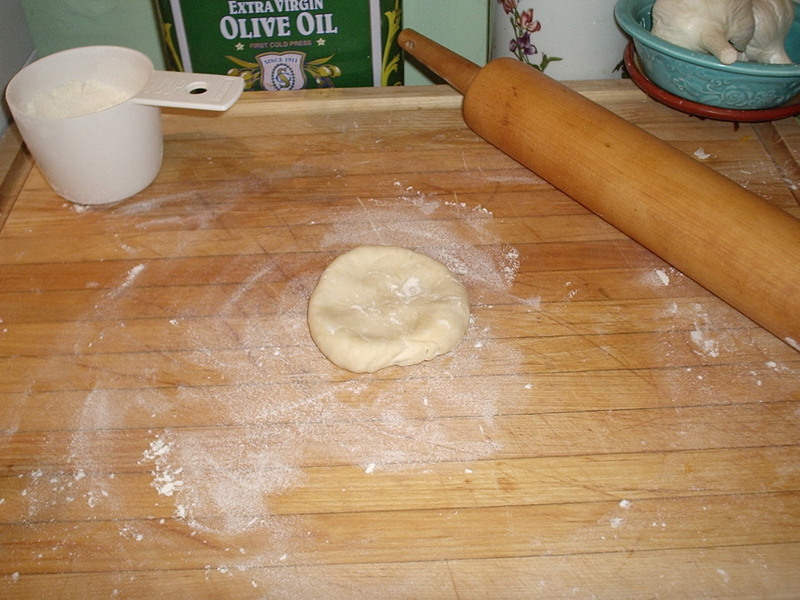 I made some dough, then took the dogs and ran to the store for eggs and some other staples while it rested. It’s dead simple really. Divide the dough in 12 pieces, roll each one out with a rolling pin (my first few were too thick, but then I got the hang of rolling them out really thin), into the skillet for a few minutes. I like meditative repetitive cooking tasks like this one. By the time you’ve got one tortilla rolled out, it’s time to flip the one in the skillet. It takes enough attention that you can get your mind off oh, the layoffs at work, and it’s just interesting enough that you have to pay attention. I had a lovely half an hour or so making tortillas on a Saturday morning. And as I was making them I was thinking of people I know who don’t like to make things. The kind of guys for example who would look at you and say “why are you bothering with all that? you can buy tortillas for three bucks.” And I was grateful to Sara Gilbert for her article, because I’ve never really understood the anxiety that making something can inspire in people who have never been encouraged to make things. We made a lot of goofy things as kids — some of them worked, some didn’t. We were okay with the provisional (although the time I was sent off to the fancy pre-deb ball in a skirt with no real waistband, but a cummerbund held together with safety pins was a little more provisional than I was happy with at the time). And because I grew up around people who were willing to give it a shot, willing to try making something as a default, it left me the kind of person who was perfectly willing to get out and whack together some cold frames, even if the carpentry is a little crude. 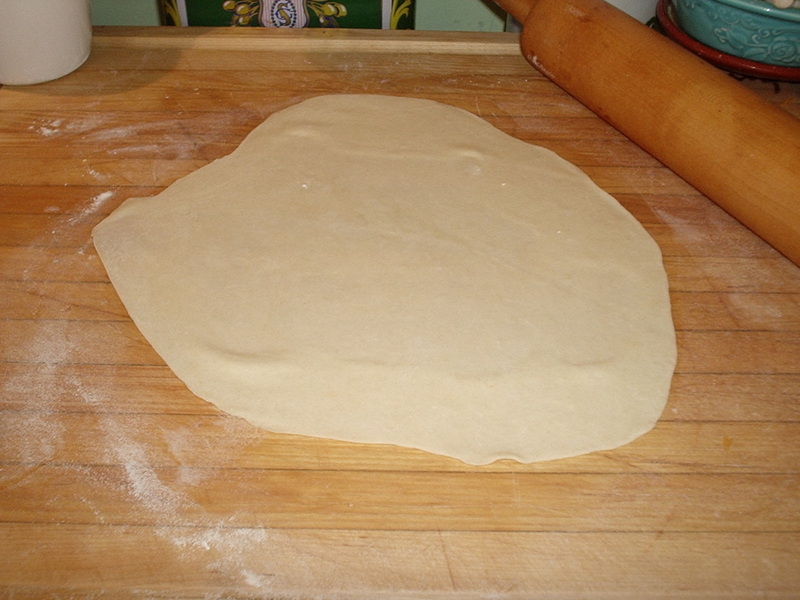 Or who will make tortillas and not be upset that the first few were sort of thick and stodgy, because the last few were really beautiful (and now I know how, and can make them again sometime). I suppose what it comes down to is that for the last decade or so, many of us who had a little money got lazy. We hired people to clean our houses. We hired people to change our oil. We hired people to cook our food. We hired people to make our clothes. We hired people to do a lot of things for us that our parents would never have dreamed of not doing themselves. And as a result, I think a lot of people got the idea that not knowing how to do anything was normal, and some sort of sign of privilege, or status. I’m kind of hoping that maybe we’ll all come a little bit more down to earth again now. That people will remember that knowing how to take care of our own basic needs is really our own most basic responsibility on this earth, and that with practice, rusty (or nonexistent) skills develop, and become a pleasure. 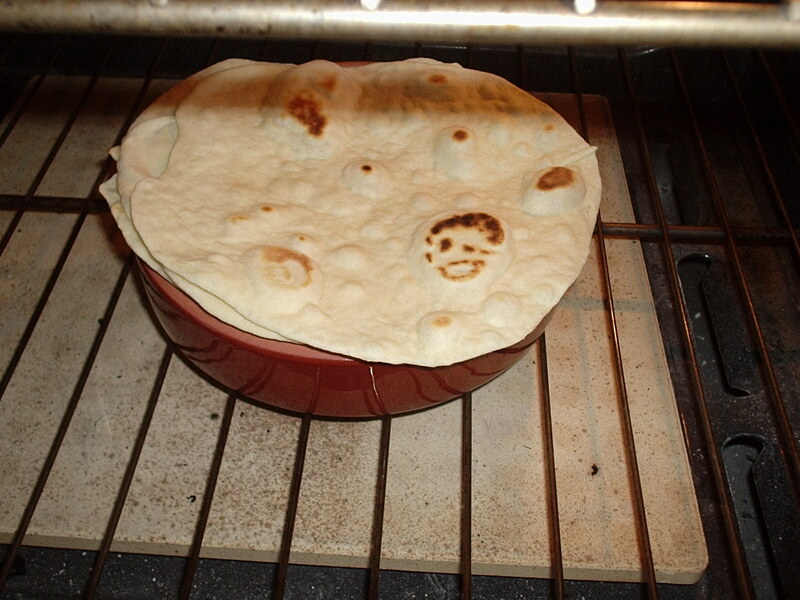 Well, I made homemade naan last night… but I have a terrible time with tortillas. I think my “thin” isn’t “thin” enough. And yes, it’s nice that after years of being the weird one who is “cheap” (their words, not mine) I’m finally the one that they look to as a “kindred spirit” when they’re trying to become frugal and need some moral support. My latest fun is rice flour muffins with little bit of apple, cinnamon, and some brown sugar on top. Mmmmmm…. You know, with cooking, there’s the added fear that you might poison your family. I’ve wanted to can for years, but I know I’m not a careful person, so i’ve convinced myself I’ll give my kids botulism! Canning isn’t hard, really. Especially water-bath canning – the directions are really straightforward. It’s just a lot of boiling things. If you want to start, I’d advise starting with jam — the sugar is a preservative in it’s own right, and many jams you don’t even have to process in a water bath, you just cook them up, sterilize the jars and rings, fill, flip them over and you’re done. Try it. You can take baby steps until you get comfortable. Added to which, life in France is so much cheaper I am just not inclined to pay UK prices anymore! PS the cryptic captcha words just told me to go bake bread! Those tortillas are beautiful! I broke down and bought a tortilla press last summer so I wouldn’t have to bake bread in the oven (we have no a/c) during the hot months. Very good points about making things. We are trying to repair, do without, build and do with what we have on our property. That’s sort of how I got obsessed with flatbreads last summer. The idea of turning my oven on to 425 when it was hot was just unbearable. So I made a lot of flatbreads on the griddle — tortillas are definitely going into the rotation. Thanks so much for this recipe, I’ve been looking for a tortilla recipe because the ones I’m buying have now gone up to $4.49/dozen and it’s making me a little purple to pay for flour and lard. I’d found recipes before, but in my memory at least they were more complicated than this. I’ll be giving it a try soon, thanks!